Thanks for all of your entries for the Food Should Taste Good chips giveaway! It was back to the grind for me this morning. I kind of like having a routine and my body seems to too, so while I wasn’t too pleased to go back to work, I welcome the routine. 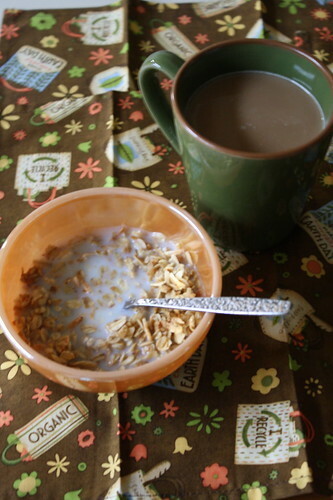 I had double coconut granola and coffee for breakfast. Have you ever walked into a place that you thought was safe and free of things that scared you, only to find it wasn’t such a safe place? Yeah, that happened to me today. 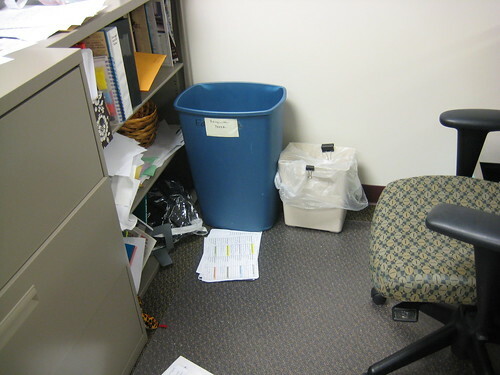 I had a little “visitor” in my office this morning. 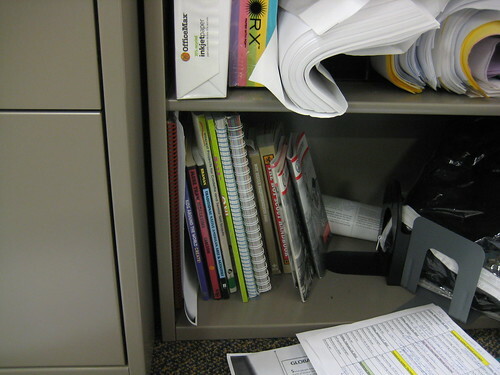 I walked into my work office and saw a small head sticking out of my bookshelf. This snake hater had a stomach ache for an hour plus, not kidding you. I later found out that someone left the cage slightly ajar and sure enough, Mr. Snake got out over the weekend. Craig says that snakes are attracted to yogis, but if they are, that means I will give up yoga to keep the snakes away (kidding, I would never do such a thing)! 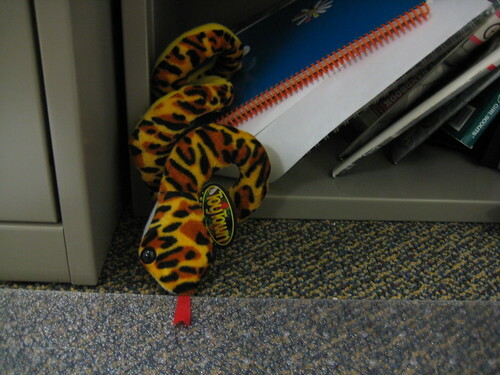 It just so happened that I had a fake stuffed snake on the upper shelves of my bookshelf, so I put him in the spot where the real snake was as a total joke. Even seeing this scared me throughout the day. I guess I have noticed a pattern this summer–nature in general has not been agreeing with me. From the pond incident, to bird poop on my car door handle, to this past weekend’s fear of bugs, and now this, I am not having so much luck with nature this summer. Craig was surprised at how scared I am of bugs in general and thinks my fear of them has gotten worse over the years. He may be right, but I have disliked snakes and bugs since I was little. 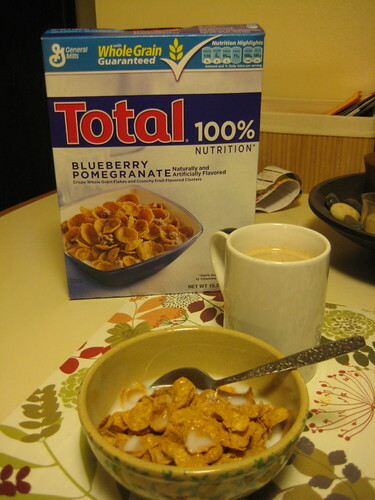 Anyway, moving onto more pleasant things, like my dinner. 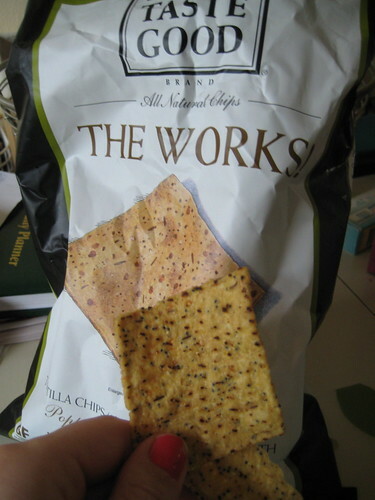 I munched on some of “The Works” chips when I got home from work. I LOVED this flavor. I adore caraway seeds because they remind me of German rye bread. 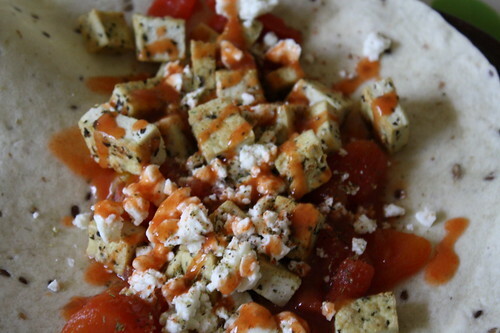 Dinner was herbed tofu, tomatoes, feta cheese, and Frank’s Red Hot sauce in a multigrain wrap. 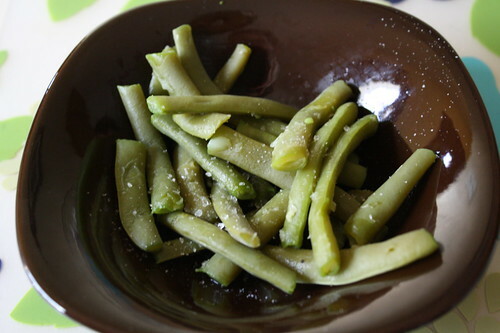 Craig cooked the fresh green beans, picked from our garden last night! They turned out delicious! I finally hit the gym tonight and it felt good to be there again after so many days away from it. I went on the Cybex and lifted some free weights.